Shark birthday party favors for girls that are cuter and brighter than other shark party favor ideas. Not all girls will be impressed by realistic shark favors. So if you're having girl birthday guests at your shark party you'll want too add some more girly party favors they'll like. This means you'll need a couple of special ones are less realistic, cuter or more colorful. . I've collected some ideas here that can make a shark party favor bag more girly. So you'll just need to mix and match with the more realistic or boy-ish party favors to create party bags for girls. Jacks is a classic girls game. I remember playing this as a child with my friends. 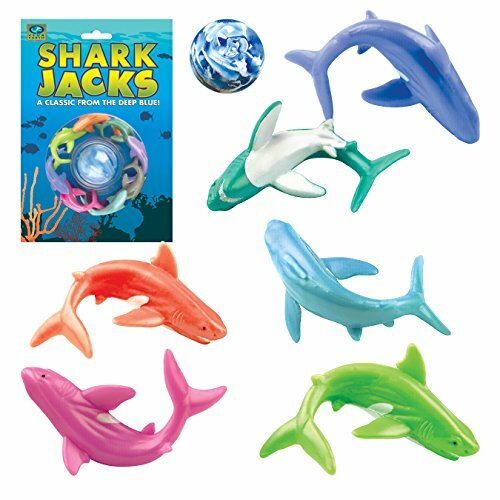 This means these Shark Jacks are a lovely idea for a girl's shark party favor bag. There's another reason why these Jacks are a good choice for girls too. Their color. 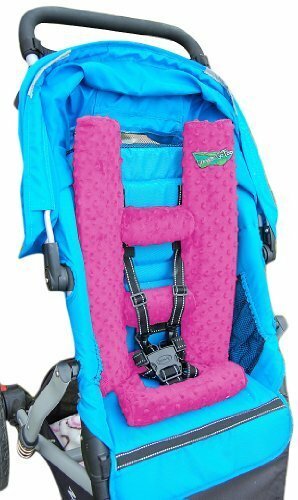 They've obviously been made for girls with a pink as well as other brightly colored sharks. This is a good way to add some color to a girl's party favor bag so there's not too much realistic shark blue. These are a fun idea for school aged girls. Younger girls won't have the coordination to play jacks so they might find this frustrating as a party favor. The ball could also be a choking hazard for very young ones. So definitely a party favor for school aged girls. Novelty erasers are very popular with school aged girls. They're usually popular with girls nearing school age because it makes them feel like a big kid. This is especially true if they have older siblings who go to school. Boys might also like this party favor. So these erasers can make it easy to create a party bag that will keep both girls and boys happy. 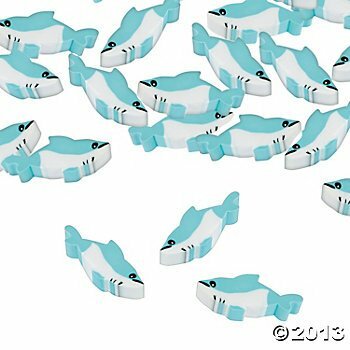 Luckily these shark erasers come in packs of 12. This makes it easier to fill up your party bags. You can also decide how many to give each child. But putting loose erasers in your party bag might lead to them being lost. So it might be an idea to wrap cellophane around them, in a color to match your shark theme. You can also use other colors, like yellow or pink, if you want to add some brightness to your party bags. This shark tooth necklace is a novel idea if you want something that is realistic but still good for girls. 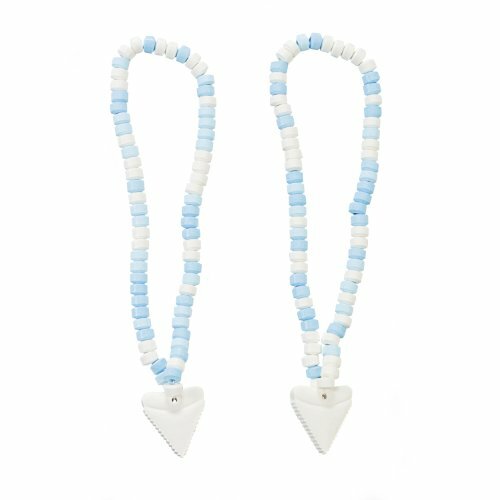 But a word of warning: If you add something like this (a shark tooth) to the girls' bags you'll want to add the same to the boys' bags too. 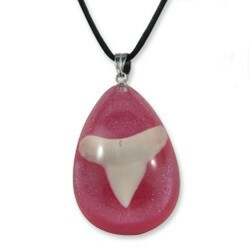 Otherwise you could have a small rebellion at your party when only the girls get something as cool as a shark tooth. This necklace comes in other colors so it's easy to do. This party favor is a little more expensive than some of the bulk buys you can get. But it would be worth it because it's such a lovely novelty and will last long after the party is over. Bubble sets are a classic party bag favor. They're also so much fun for younger kids. 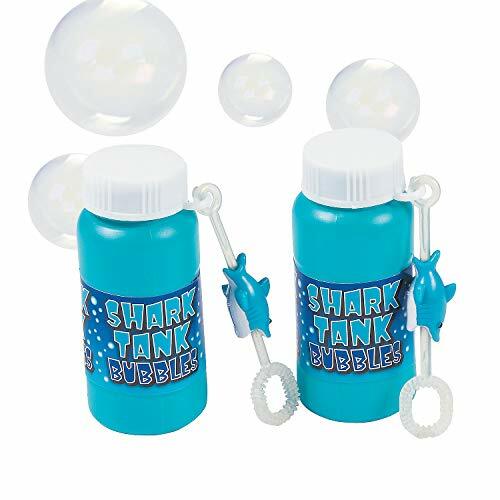 I thought these shark themed bubble sets were a fabulous favor idea for girls. They're also really good for your party budget because as formal party favors they come in bags of 12 at a great price. So definitely one to add to you must have list, if your party guests are in the right age group to enjoy a bubble set. Candy necklaces are a classic party item you don't see too often. 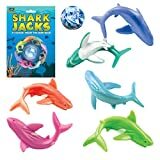 They're a fun favor to add to your birthday bags and better than candy that isn't shark themed. This is because it's more exciting to keep to the birthday theme of sharks. Even thought this item is currently unavailable I decided to keep it in my article because they're such a great idea. I'm hoping they'll come back in stock. So check to see if they're available. This is a fun party favor for bath play at home or warmer weather. This shark is cute so good for girls even though it's in realistic colors.. This is also another good one for both boys and girls who are preschool age or in the lower school grades. 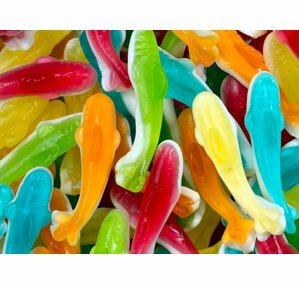 Having shark candy at your party is important because of the excitement it creates to have themed candy. It makes the party feel special. This candy is more colorful than the blue and white shark gummy (or gummi) candy. So I feel it's better for girls. This candy would also look great wrapped in nice bright cellophane to make the party bags look colorful. 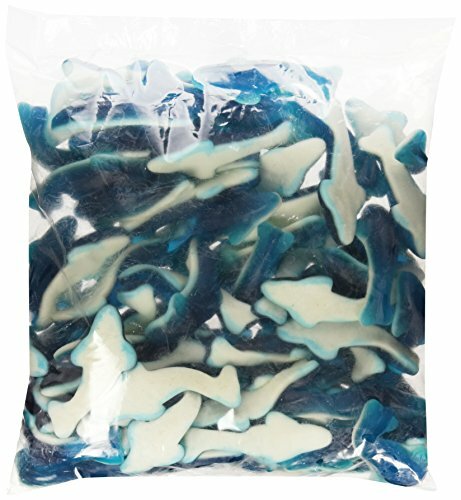 These shark gummy candies would also look great on your party table mixed in with blue and white shark candy so it's a good choice for a shark party - not just shark birthday party favor bags. If you're looking for a shark party craft that girls will like too this origami craft is a fun idea. This shark puppet is very cool. It's better than normal origami because it makes a puppet. So it's fun. This is also a craft that needs concentration to make. This means it's good if you want something to calm and refocus the kids for a while. Planning a shark themed birthday party? Get your teeth into these fun shark birthday party favors.